The Philly Fixers Guild is an independent collective of talented volunteers from differing technical backgrounds who are committed to the idea of “repair rather than replace.” The Guild was started in early 2014 by Ben Davis and Holly Logan who were volunteering together for a community sustainability program in Philadelphia’s Fishtown neighborhood. In most instances guild members will not simply fix items for people, but rather work with them to teach the troubleshooting and repair process. Ultimately, our community will benefit from less waste and improved economic conservation. 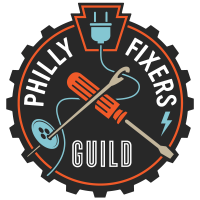 The Philly Fixers Guild is certainly not the first organization of its kind. Many other cities: Seattle, Boston, New York, San Francisco, to name a few, have had programs similar to this for some time. Philadelphia’s own Time4Time community time bank runs a periodic Repair Cafe in Chestnut Hill. One concept that all these groups share is that the disposable “planned obsolescence” consumer culture we live with today isn’t always beneficial to the environment or people’s bank accounts. We aim to support our community and city through periodic “Repair Fair” events where we can offer no-cost repair labor, knowledge, and education to all. Support the community through the efforts of talented volunteers who are available to help guests repair their broken or damaged possessions for little or no cost. Benefit the environment by reducing waste created by planned obsolescence, damage, or simple component failures. Help members of the community save the cost of replacement of otherwise viable items. Use repair events to educate people, young and old, who might be interested in mechanics, engineering and IT.